I wear a lot of Givenchy myself and I am a huge fan of Ricardo Tisci. I think he is ever so talented and has created a spectacular brand image for Givenchy. Likewise to the collection, the images previewed here were somewhat "all over the place" which created an unexpected, exciting and not so serious vibe to a fantastic brand. I feel that with Givenchy it is about surprising the clientele swell as producing pieces which are loved by not only the loyal clientele, but any potential customers. Despite the loud pieces of this collection, I sensed a very calm and collected vibe from the looks we were presented here for the Pre-Fall 2016 collection. Maybe it was the burgundy striped pyjama inspired set, displayed during the middle of the images - creating a very relaxed and lounged feel. 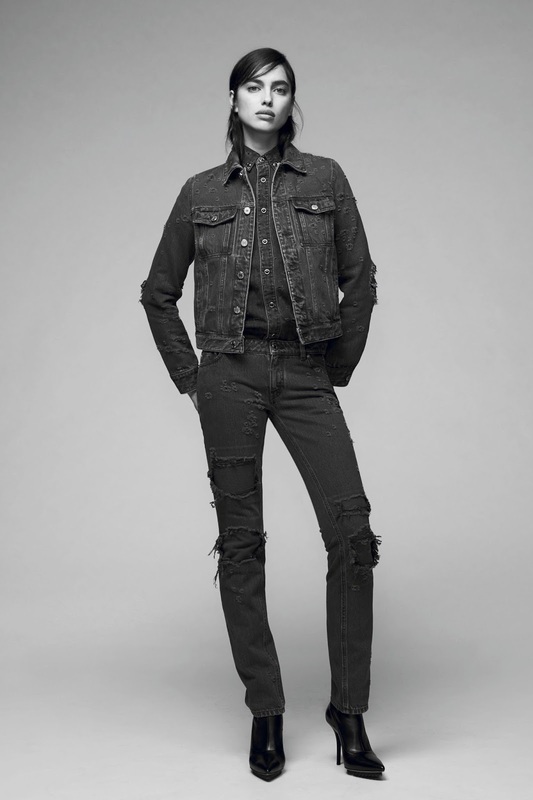 Or maybe it was the denim series at the end of the preview - images being edited in black and white, letting the all denim looks do the talking. I noticed that Ricardo had incorporated a lot of black and dark tones into this collection, with sparks of colour here and there. I loved the star printed oversized coat teamed with the black clutch and shoes. It was simple - yet effective. Then, out of nowhere, came the fuchsia cami, nightdress inspired teamed with a statement clutch bag reading "LOUD." This word describes the look perfectly. There was a printed suit, teamed with studded boots and matching shoulder bag, where the top and trousers also matched the suit. On paper, this screams out there, but Tisci has tailored it to the point where it oozes elegance and is actually rather subtle. Maybe the calm backdrop of the image reflected that feel onto the outfit.. who knows. But what I do know is that matching suits will be a hit this Autumn/Winter. We saw character in the form of platformed shoes, fluorescent pink shoes, and a victorian inspired floral suit with red socks and studded brogues. Givenchy is about expressing yourself and feeling comfortable with your own individual style - and this collection presents that to us perfectly.